Providing a warm and stimulating environment for our Hula Babies with rocking chairs, soft classical music, soft lighting, and loving nurturing teachers make the Hula Babies feel like they are at home. Each family develops their child’s daily schedule. Your family sets nap time, playtime and bottle times to ensure consistency between home and Pineapple Cove Academy. Each of our babies has their own personalized crib and linens. Baby food, formula, whole milk and finger foods (when appropriate) are provided by Pineapple Cove Academy (Bayside). We strongly encourage an open door policy, and phone calls throughout the day allow you to speak with your baby’s teacher directly. Our one year old toddlers classroom provides a safe, caring atmosphere, a reassuring routine, and many exciting stimulating activities. Imaginary play, blocks and puzzles, creative art and lots of books are always available for discovery. Teachers emphasize social growth through circle time with stories and songs incorporated into each day to encourage language skills. Pineapple Cove Academy’s two year old curriculum concentrates on the importance of balancing home and school. If home and school are connected in positive and respectful ways, children feel secure. During this year your child’s vocabulary starts to increase. Class begins with a circle time practicing their colors, shapes, numbers, letters, Spanish words, and sign language. Two year olds are learning about themselves and their abilities, and begin to develop friendships, confidence, and self-esteem. Our three year old classroom environment encourages your child to explore and learn. Through language and literacy we introduce high-quality literature to promote a love of reading. Children are taught math skills by introducing them to numbers; including sorting, grouping, and counting, as well as more advanced skills. Group time allows your child to talk, listen, share, take turns, cooperate, interact with friends, and learn the value of giving and receiving feedback. Creativity and imagination through dramatic play and music and art activities gives your child the opportunity to express their ideas in order to build confidence, independence and imagination. Voluntary Pre Kindergarten (VPK) is a FREE program for each four-year-old born on or before September 1st of the current school year, who resides in Florida to attend a quality preschool program. The goal of our program is to build a foundation for each child’s educational success. Our VPK quality pre-kindergarten program gives your child an opportunity to perform better in school and throughout life. VPK classrooms at Pineapple Cove Academy offer experience in intellectual, social, emotional, and physical domains. Your child’s development is enhanced by an outstanding environment including but not limited to the following: literacy-reading and library-listening centers, puppets, math, science, music, creative art, physical-fine & motor skills, dramatic play, small & large group times, story time, sensory, computer, cooking, enhancement activities, family and community involvement. Your child’s experience with preschool will be the beginning of a life long love of learning. At Pineapple Cove Academy our teachers have Early Childhood and Elementary Education degrees, both Bachelors & Master Programs. The teacher assistant holds a minimum of a FCCPC (Florida Child Care Professional Credential). All of our professional, dedicated teachers are experienced in the preschool environment and come to us with exceptional references. Pineapple Cove Academy has programs to meet the needs of every family. We would love the opportunity to discuss which program would work best for your family’s needs. How do I register for VPK? Simply contact the agency listed below and they will direct you toward obtaining a certificate to enroll your child at Pineapple Cove Academy. Pineapple Cove Academy's school-age program provides a safe and fun place to go before and after school that includes a nutritious breakfast and after-school snacks. We provide a unique themed curriculum to keep your school-ager motivated and focused in a fun and stimulating environment, even after school ends. Children get to spend time with friends and enjoy activities that are relevant to their interests. We strongly encourage fitness activities daily to keep your child active and healthy. Our school-age program also aligns with Brevard school calendars to provide a fun filled (and educational) program during holidays, teacher in-service days, other school breaks, and of course our fun-filled and educational Summer Camp! The fun never ends at Pineapple Cove Academy. We offer a variety of extra-curricular activities to add excitement and new learning opportunities to our weekly curriculum. How do you decide what your child participates in? Every child is different, and their needs and ability to engage in extra curricular activites can vary from year to year, even from season to season. Allowing your child to get involved is a wise choice and can be a significant part of your child's growth. Join the Peppy Pineapples of the PCA Cheer Team as we RAH! RAH! RAH! in the community and boost school spirit! A fun peppy exercise and fitness program for ages 3 and up teaches teamwork, discipline, communication, and coordination. 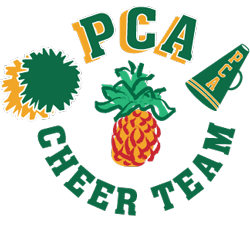 The cheer team will perform at Pineapple Cove Academy events and serve as our honorary PCA cheerleaders in the community! Please see administration for tuition and uniform information. The Pineapple Pro Sports Club is an exciting sports program that teaches children at an early age the invaluable concepts of responsibility, respect, leadership, cooperation, and teamwork through sports related activities. An early introduction to these concepts builds positive character traits in children that will last a lifetime. The program activities are age and skill specific, fun, and use creative techniques all in a safe environment. For children ages 3-VPK. 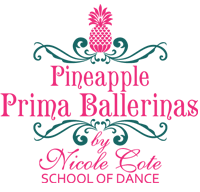 Pineapple Prima Ballerinas is a 45 minute weekly class designed to teach the fundamentals of dance including; movement, coordination, rhythm, timing and memorization along with building self esteem. Pineapple Cove Academy is proud to partner with Nicole Cote School of Dance offering ballet and tap for our 2-5 year olds. Canvas & Clay Classical Art gives your child an introduction to fine art. We know that through the arts, a child’s awareness of the world around them comes to life! Each week your child will look at the prints from different artists and periods throughout history. In learning about the great masters of art, your child will see the creativity, ingenuity, and imagination that have inspired countless generations. For VPK & school-age children. Pineapple Keiki Karate at Pineapple Cove Academy is taught by Sensei Joe Laughlin, who is a 2nd degree black belt and has studied martial arts since 1983. Students learn American Karate, which is a blend of every style of the martial arts. Students benefit by learning: Self-Discipline, Respect, Self-Esteem, Coordination, Focus, Self-Defense, and Honesty. For children ages 3-VPK. School-age children can also attend our themed summer camp, which provides lots of fun and learning throughout the summer. Starting at the end of May and during the summer months our school age summer campers will spend their vacation exploring, learning and visiting many local venues. Some highlights are trips to Universal Studios , Fun Spot, Gatorland, Planet 3 and team building activities. We'll culminate our summer camp theme with the much loved Color Wars challenge, in which each camper will work with a team to complete fun, interactive challenges.